Israeli aircraft fires on terror cell launching firebombs attached to balloons towards Israeli territory. An Israeli military aircraft opened fire on a group of Arab terrorists operating in the southern Gaza Strip, an IDF spokesperson said Wednesday afternoon. According to the IDF, a group of terrorists in the Hamas-ruled coastal enclave were spotted launching ‘terror balloons’ – firebombs attached to helium balloons – towards Israeli territory. An IDF aircraft then opened fire on the cell. “A short while ago, a terrorist was identified launching arson balloons from the southern Gaza Strip into Israeli territory. In response, an IDF aircraft fired towards the terrorist,” the army spokesperson said. 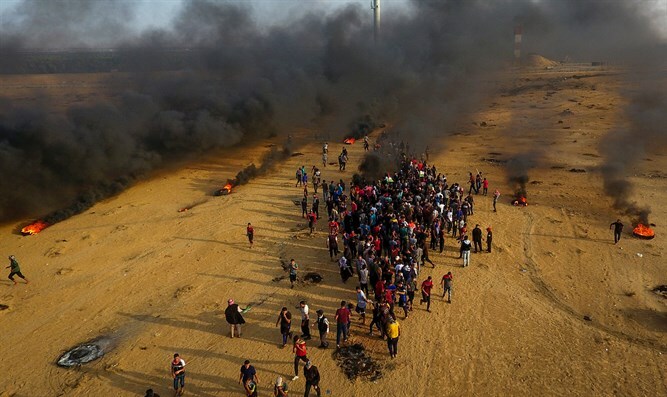 The Palestinian Authority WAFA media outlet claimed that the incident had occurred near the al-Burejj refugee camp in the central Gaza Strip. No injuries were reported, according to WAFA.